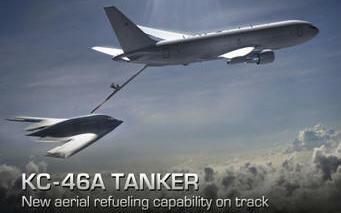 April 9, 2013 - The top acquisition priority in the Air Force acquiring a new aerial refueling capability is proceeding "on track," Maj. Gen. John Thompson, the program executive officer for Tankers, said. Two years and several key milestones after the contract was awarded, a great deal of progress has been made. The preliminary design review completed last year ensured the basic design would meet the key performance parameters required by the Air Force. Now, the program is steaming toward the completion of the critical design review later this year setting the stage to build and fly the first KC-46A Tanker in 2015. Initial concerns that sequestration could force a contract renegotiation appear to be allayed based on increased flexibility afforded by the recent continuing resolution. "There is no final assessment yet, but it appears positive," Thompson said. The Air Force contracted with Boeing in February 2011 to acquire 179 KC-46 tankers to begin recapitalizing the KC-135 Stratotanker fleet. The initial delivery target is for 18 tankers by 2017. Production will then ramp up to deliver all 179 tankers by 2028. "When the final KC-46s are delivered in 2028, they will replace KC-135s that are on the order of 80 years old," Thompson said, emphasizing the criticality of meeting program milestones. The KC-46 contract has been widely cited as a model for future programs. Characterized as "fair to both parties" by Thompson, financial risk for the Air Force is limited to $4.9 billion for the development program, which includes the initial four aircraft. The general is quick to add that Boeing has the contract, which is "worth about $32 billion in then-year dollars, goes from about two years ago out into the 2020s and is something that they will be able to leverage into a very important weapon system for the U.S. Air Force for decades to come. Absolutely, it is a win-win." The KC-46 is a commercial derivative based on the Boeing 767-200, said Col. Shaun Morris, the KC-46 System program manager. When a new 767-2C is completed in the Boeing factory in Everett, Wash., it will be flown to Boeing facility in Puget Sound to complete the military modification that turns it into a KC-46. The aircraft brings a wide range of new capabilities to the warfighter. It is 15 to 20 percent larger than the KC-135 and can carry 58 passengers, 54 aeromedical patients and 18 cargo pallets -- all substantially more than the legacy aircraft. Performance is also improved with the ability to perform boom and drogue refueling operations on the same sortie, though not simultaneously, using the 1200 gallon-per-minute fly-by-wire centerline boom or the 400 gallon-per-minute centerline drogue system. In addition, the KC-46 can be equipped with two 400 gallon-per-minute wing air refueling pods which can be used to refuel two aircraft simultaneously. The new tanker will be fully capable of day and night operations and also be a receiver itself meaning it can be refueled in flight, which will improve loiter time all important characteristics offering increased flexibility for mission planners. Inside the digital glass cockpit, pilots will find complete flight and weather data on 15-inch displays. Immediately behind at the boom operator station, 24-inch displays will offer a three-dimensional view just below multiple monitors that show a panoramic 185-degree field of view. Pilots will also be able to bring up refueling operations on cockpit displays. On the near horizon, the program office is looking to award a contract for the Aircrew Training System, which includes a KC-46 simulator. In 2014, the program office, in concert with Air Mobility Command officials, will begin serious initial requirements work on the second phase, known as KC-Y, of the three-phase program to replace more of the aging tanker fleet.